Well, it really did happen. 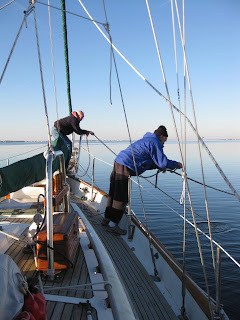 After about a week of packing and provisioning the boat, on 4 January, 2013 at approximately 1:40 pm, Bud, Fred, and I let go the lines to our dockage and headed down the Intracoastal Waterway. Our friends, Joe B and his dog Mullet and Fred’s wife Peggy, wished us well as we pushed off. Now, the only thing keeping us from continuing on our journey is Layla herself. Bud sorting through his fishing gear. Can we fit all of this in the lazarette??? And where does all this go???? One final greasing of the pillow block. Fred letting go the lines. Joe B and Mullet sending us off from Front Street. 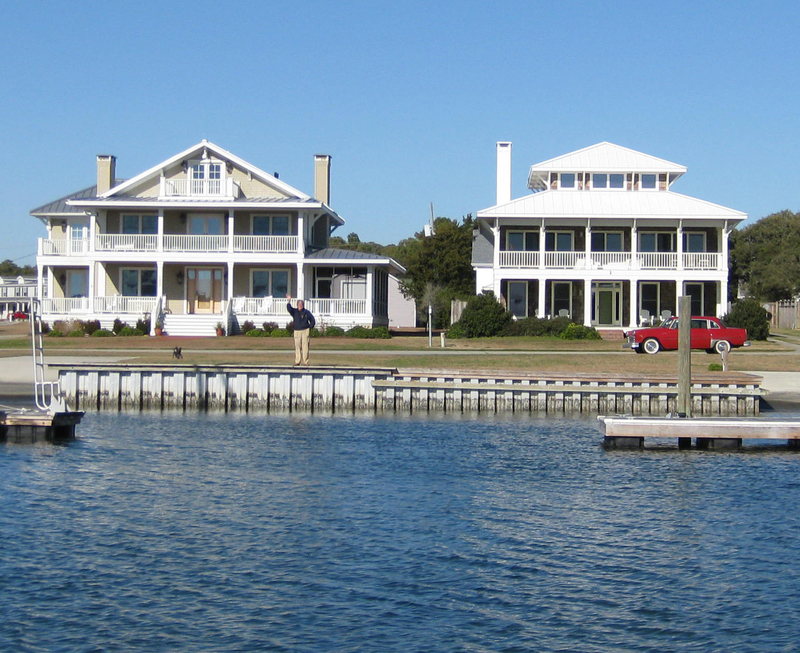 We passed by our old stomping grounds at the Duke Marine Lab, and our house on 8th Street in Morehead City. 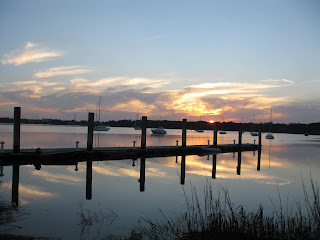 By sunset, we made it to the far side of Morehead City, and dropped the hook. 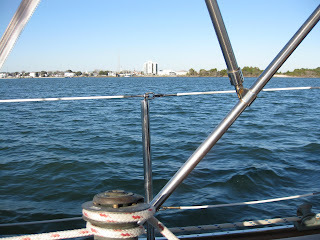 At this rate, we figured we would be in the Bahamas about the time all the cruisers start heading north for the summer! 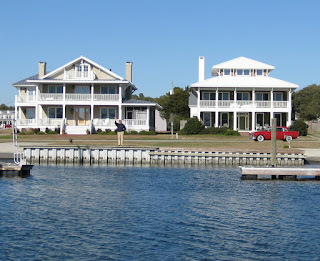 Passing by our house in Morehead City, NC. 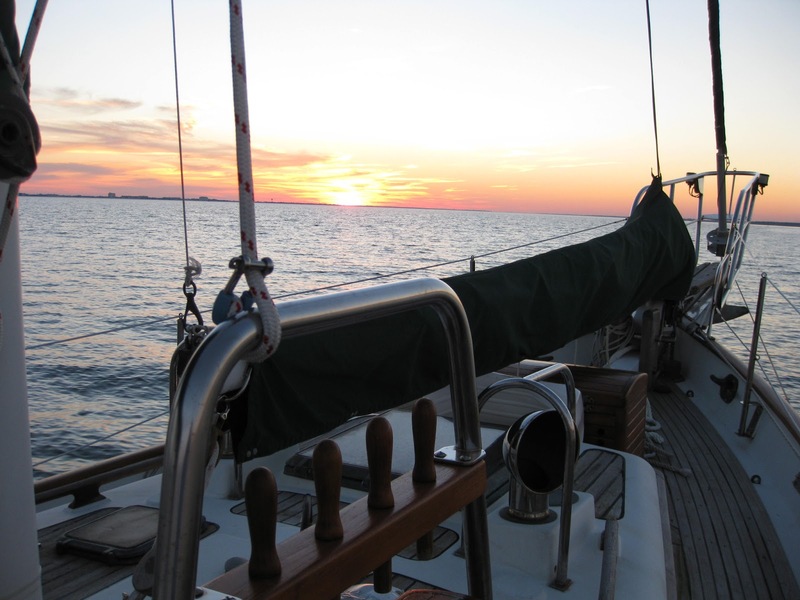 Our first anchorage in Bogue Sound. 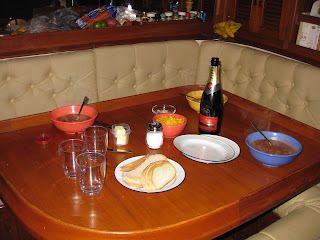 Our first dinner of Bud's chili and champagne (kindly provided by my coworkers at the CDC). 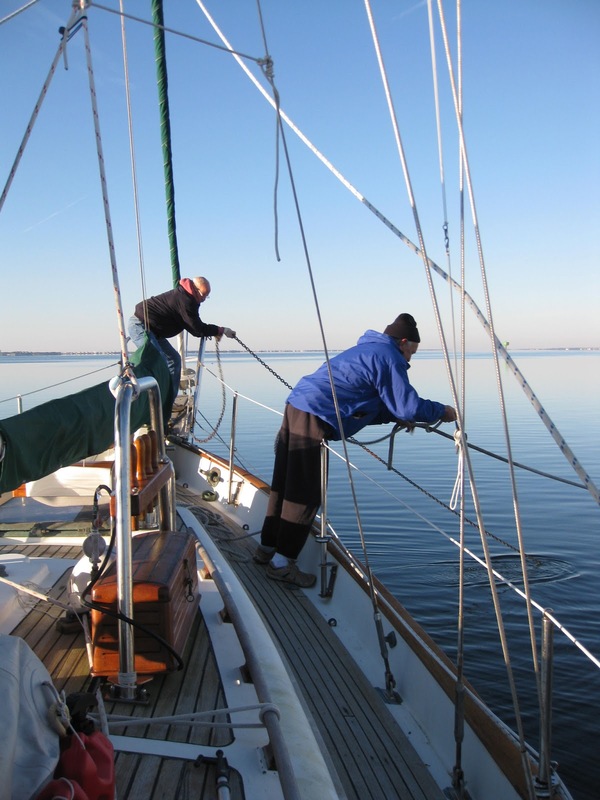 We increased our mileage with each subsequent day, slowing down only by occasional groundings. We have had the good fortune of traveling with another couple on a 58’ Alden with a 130 hp engine. Acadia and her captain and crew (Ernie, Sarah, and their dog Oliver) are capable of pulling Layla out of almost any grounding. 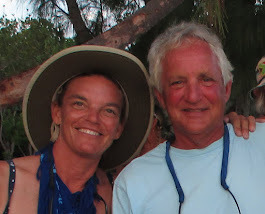 Our traveling companions: Acadia with its capable crew, Ernie, Sarah, and Oliver. Our first of several groundings. Although we deserve the brunt of most of the grounding jokes, Layla has not been alone in going aground. 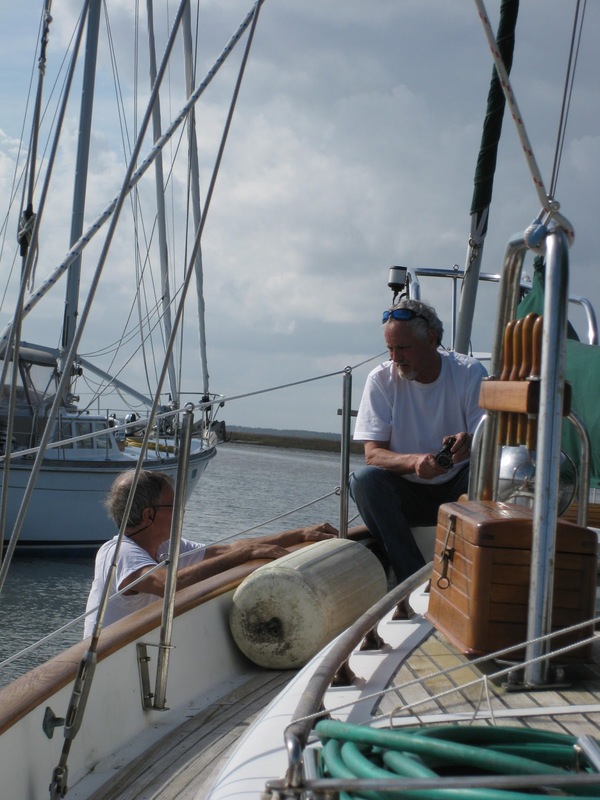 Just north of Charleston before heading into the Charleston Harbor, we had the misfortune of both boats hitting bottom almost simultaneously on a falling tide, and had to wait for the tide to rise. Luckily for all of us, it was a beautiful sunny day around 80oF. Not only did Acadia pull us out of trouble, but her dinghy also served as a tow boat. 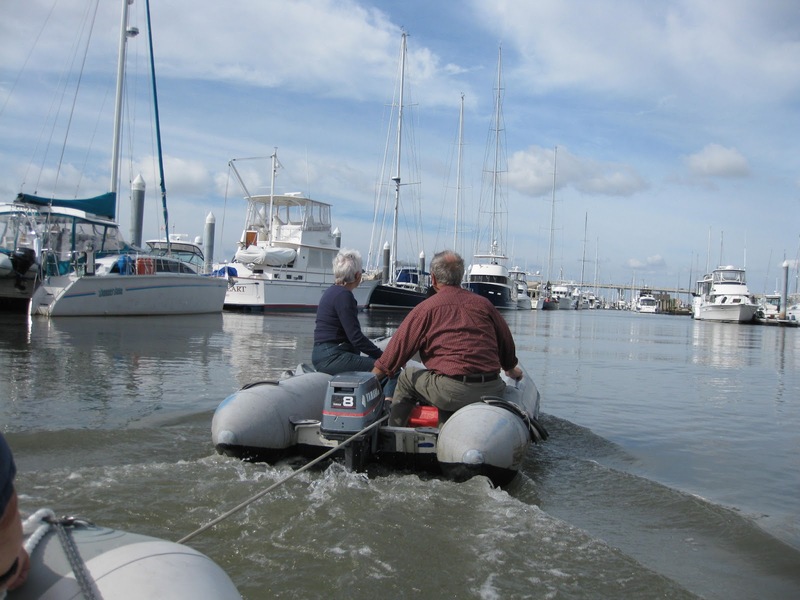 We launched our dinghy, Zoe, for the first time once anchored off the Charleston City Marina, but had trouble getting her started. It appeared to be a fuel delivery issue. We bought a brand new fuel hose/bulb/connectors, which seemed to solve the problem. 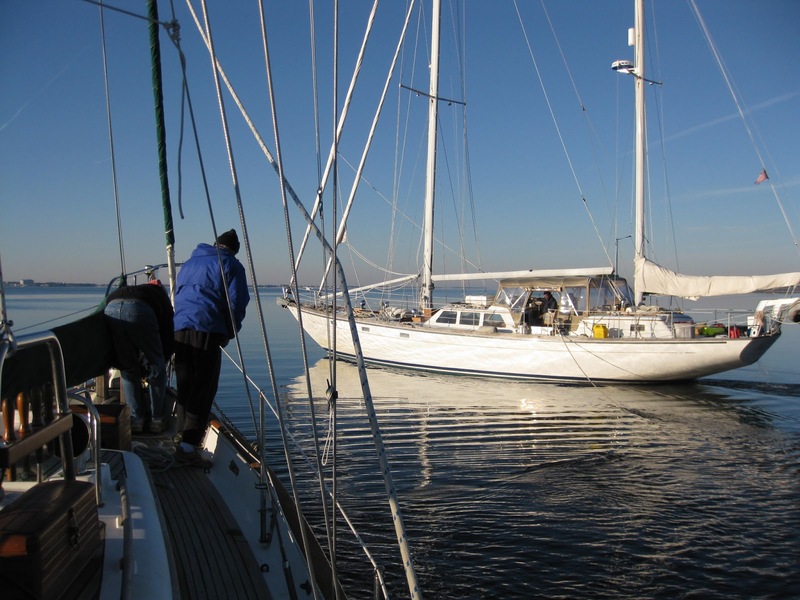 However, on occasion, we found ourselves needing a tow from Acadia's dinghy. Ernie and Sarah on Acadia's dinghy, to the rescue. 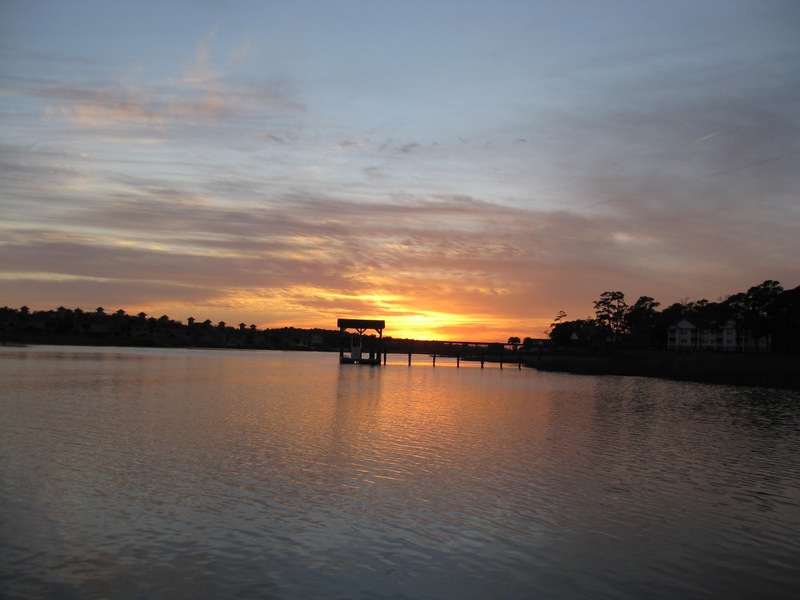 From Charleston south, our grounding woes turned into repair woes. 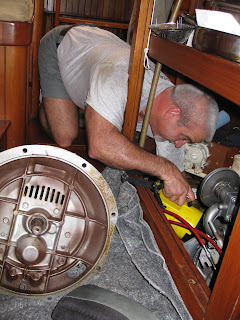 On our way to Beaufort, SC, in the middle of Gale force winds and driving rain, our transmission would not go into forward gear. We found out quickly that Acadia is just as capable at towing Layla down the ditch as she is in pulling Layla from the mud. 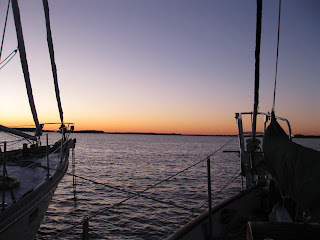 Acadia towed us about a mile up the creek to B&B Seafood, and docked us safely behind her. 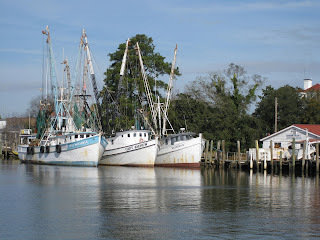 This turned out to be a bonus dockage, as they also sold fresh shrimp, and we bought some of the last fresh shrimp of the season. 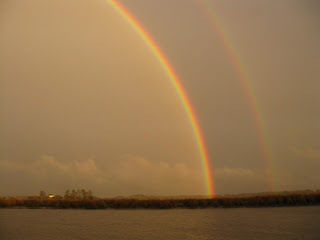 And, the front passed through just after docking, leaving behind a full double rainbow across the marsh sky. Despite the symbolic meaning of a double rainbow, we watched as our life transformation turned into repair transformations. As Bud and Fred troubleshooted the transmission problem, things went from bad to worse, and we were no longer able to start the engine. Now there was no hope to troubleshoot the transmission if we couldn’t even turn on the engine. 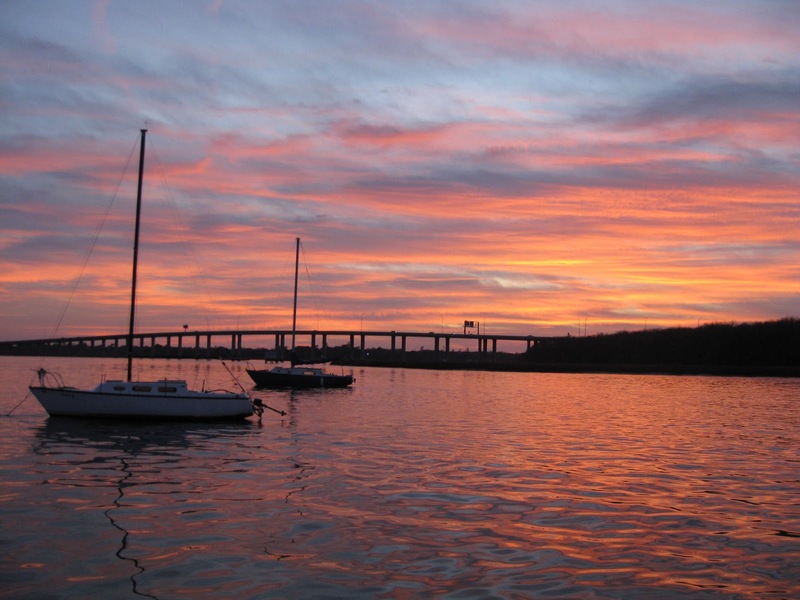 Acadia came to the rescue once again, and towed us down the intracoastal to the next anchorage in Beaufort, SC. Bud and Fred checking out the transmission. 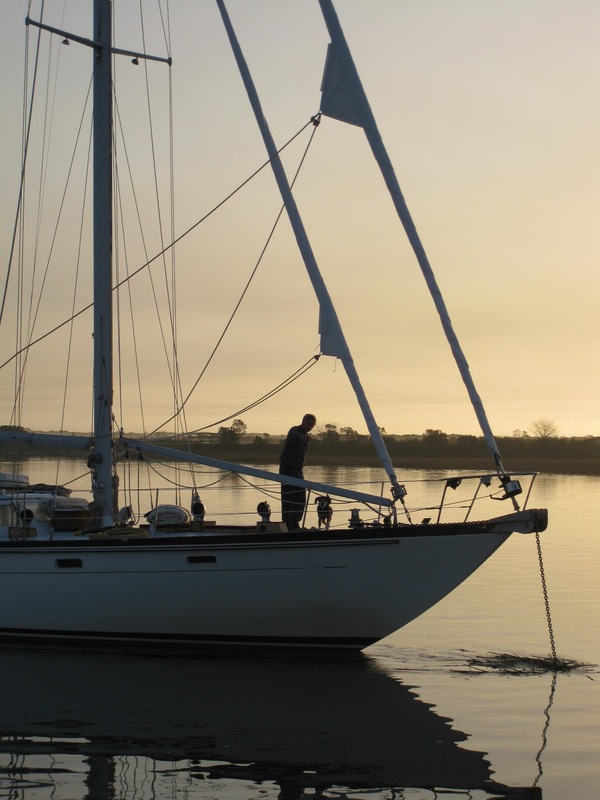 Once anchored securely in Beaufort, we were given the name of someone who was good at engine repairs. Jim DeMartin had experience with Yanmar engines, and was extremely good at helping us troubleshoot the faulty relay. He helped us order the part, and helped build our confidence in troubleshooting new engine problems when they arise. 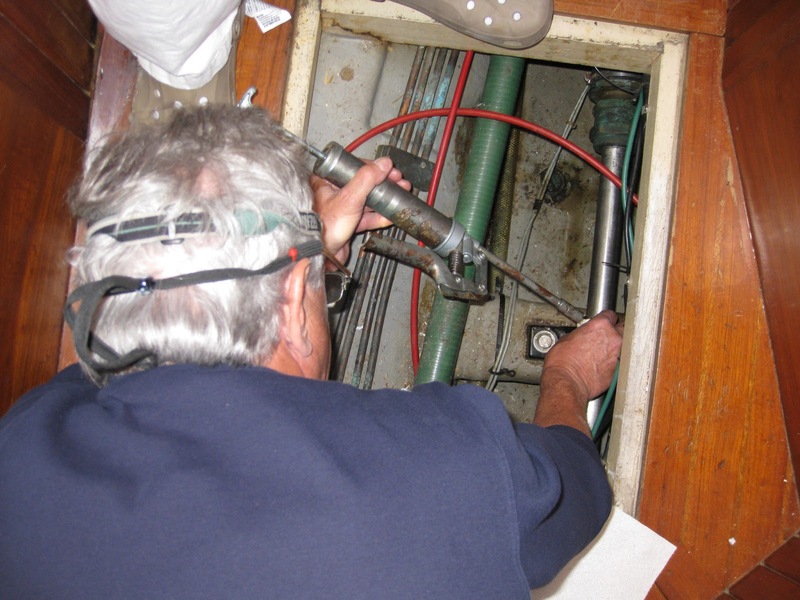 About the same time as the relay was delivered, we noticed that the bilge pump was pumping more frequently and with more volume. 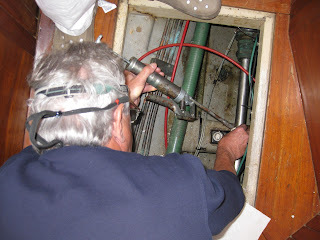 We finally tracked down the leak to the hot water heater, which had a nice sized hole in its side. A trip to the library to order a tank online, a couple days shipping, and a couple of trips to the hardware store, and voila, we have hot water again. 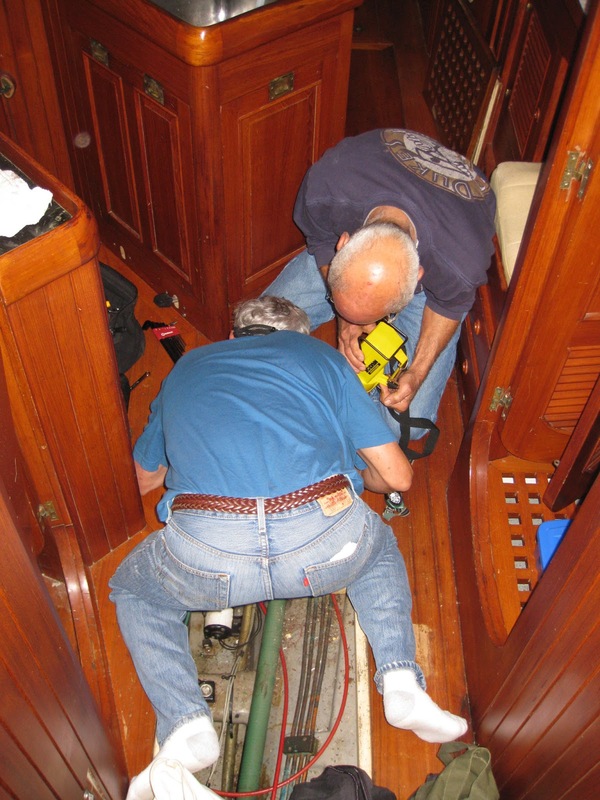 With the engine now running, Bud and Fred spent a day aligning the transmission. 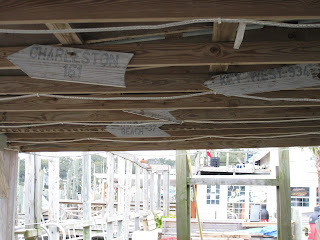 We thought it went into gear better than before, and made plans to finally leave Beaufort. Just about exactly one week to the day and time we arrived in Beaufort, we headed out. 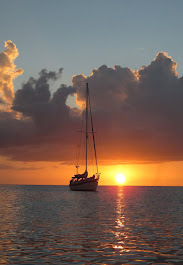 Although we had a bit of a challenge getting into forward gear starting out, we had no other problems along the way. 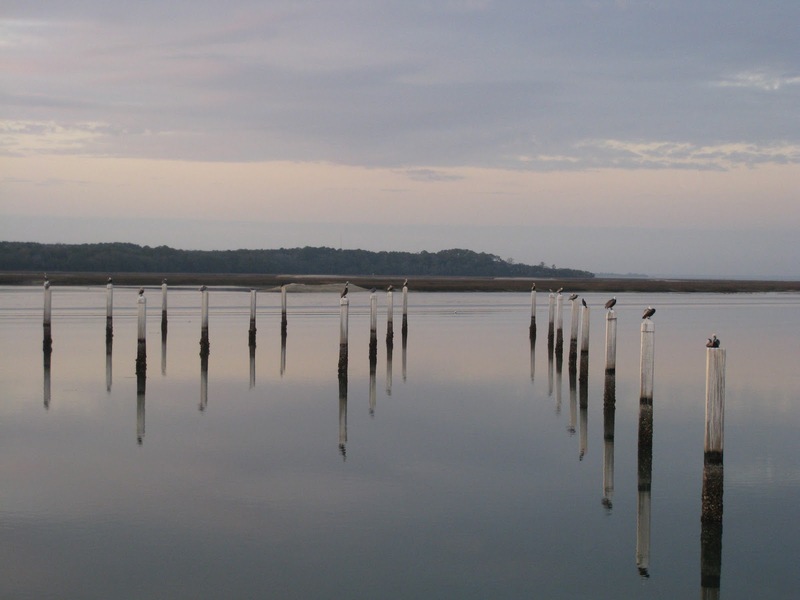 With leaving so late in the afternoon, we really didn’t get far from Beaufort, anchoring in a little creek near the Hilton Head bridge. We planned on getting up early the next day and finally getting some miles under our belt. However, our plans and Layla’s plans were not aligned. The next morning Layla decided that she wanted to stay put. There was no way to force the transmission into forward gear, and so we did just that. It was Sunday, and there would not be any possibility for repairs until the next day. 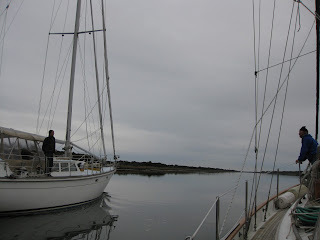 The next day turned out to be the most adventurous day yet, as Acadia had to tow us through a 65 foot bridge at high tide, and we had to dock our boat against the tide at a fuel dock running perpendicular to the tide. 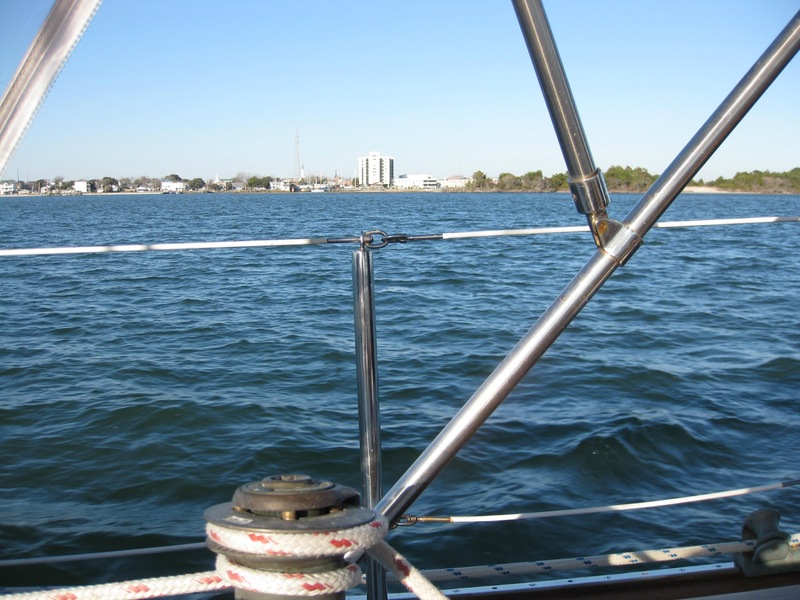 We missed a head on collision of Layla’s bowsprit with the bridge pilings by millimeters as Acadia slowed down to squeak under the bridge and we drifted toward the bridge pilings. 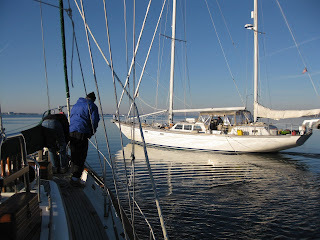 We regrouped and attempted the tow again under a bit more power and succeeded with no damage to either boat. 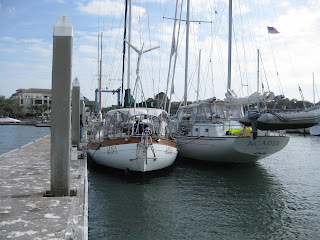 When we got close to the marina, we decided to raft the boats for docking. 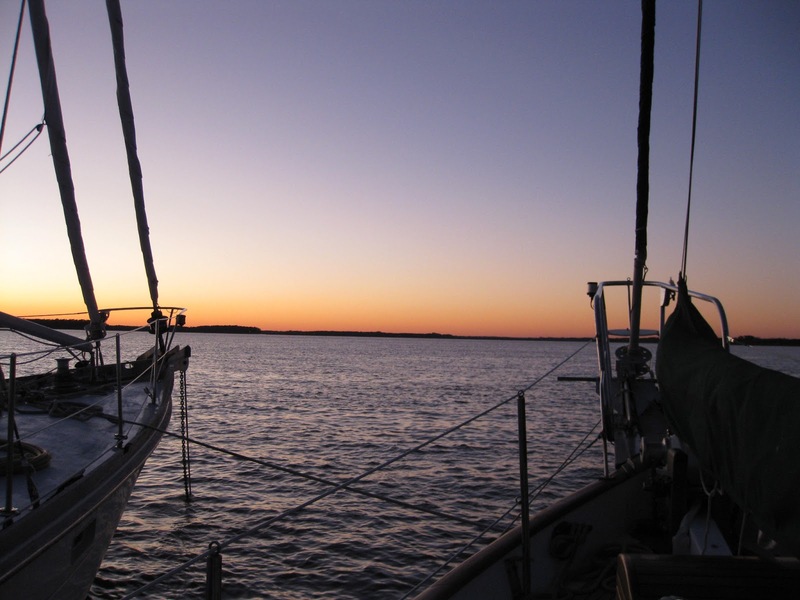 With barely enough space for the two boats side-by-side, Acadia used her powerful engine to push us to the dock gracefully. 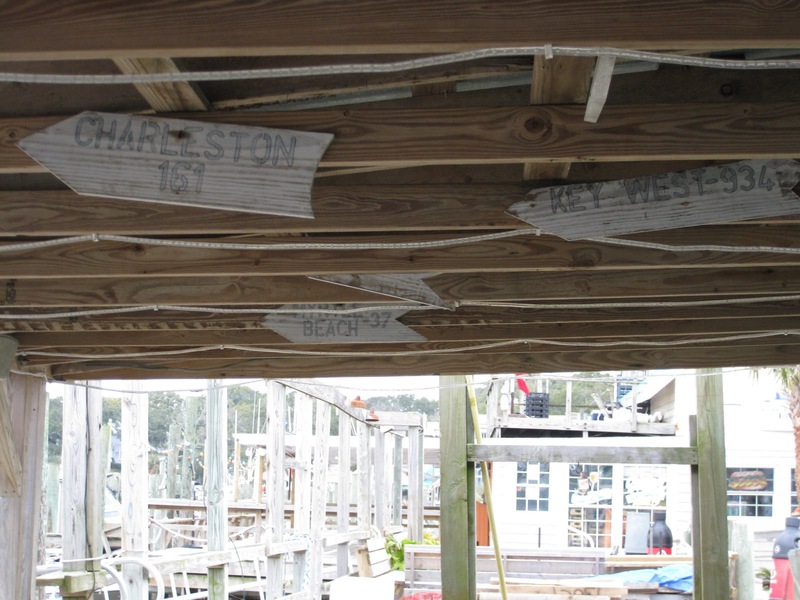 It was a beautiful work of maneuvering, and no one was injured nor was any boat damaged. Despite the stressful situation, and wanting to put this behind us, I will always remember this as one of the highlights of our trip. 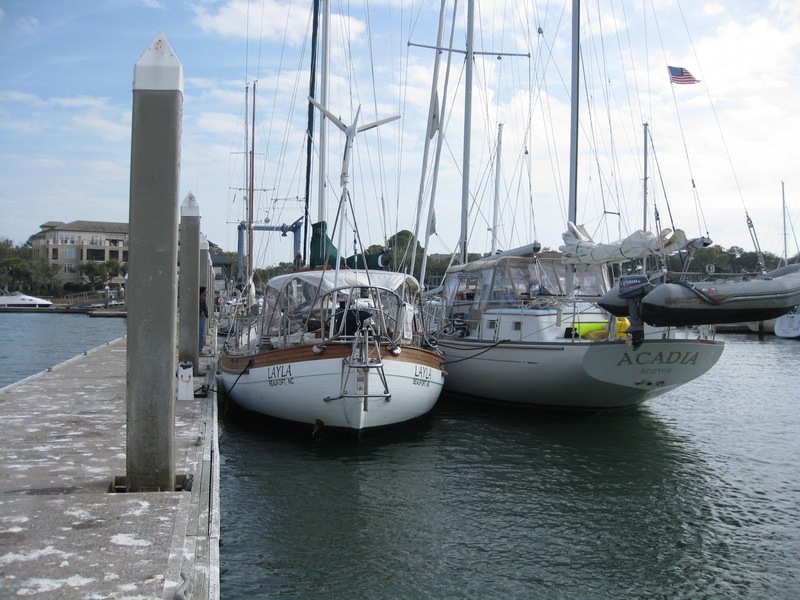 Acadia and Layla, still rafted together after the remarkable docking. 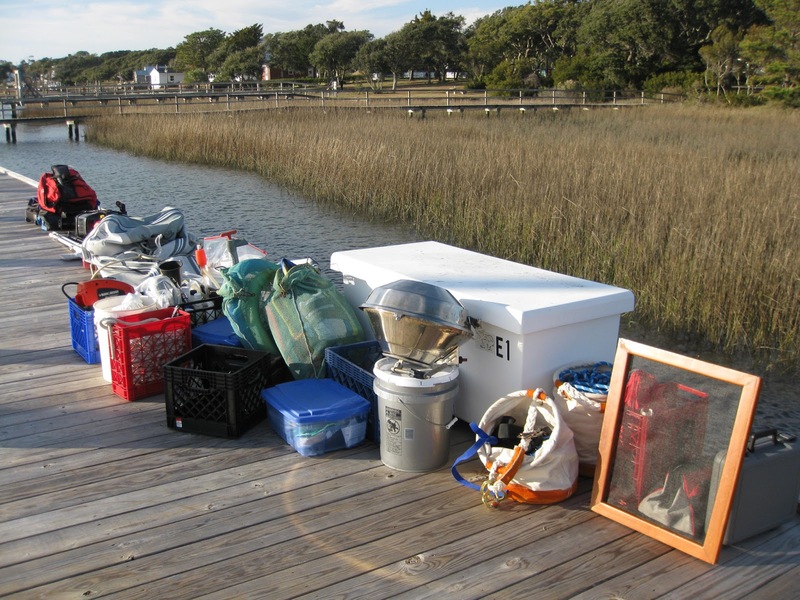 After two separate evaluations, it was clear that we would be staying in Hilton Head for a while. Layla needed a new transmission. Refurbishing our transmission would take about a month, buying a rebuilt transmission would take two weeks, and purchasing a new transmission would get us operational in a couple of days. 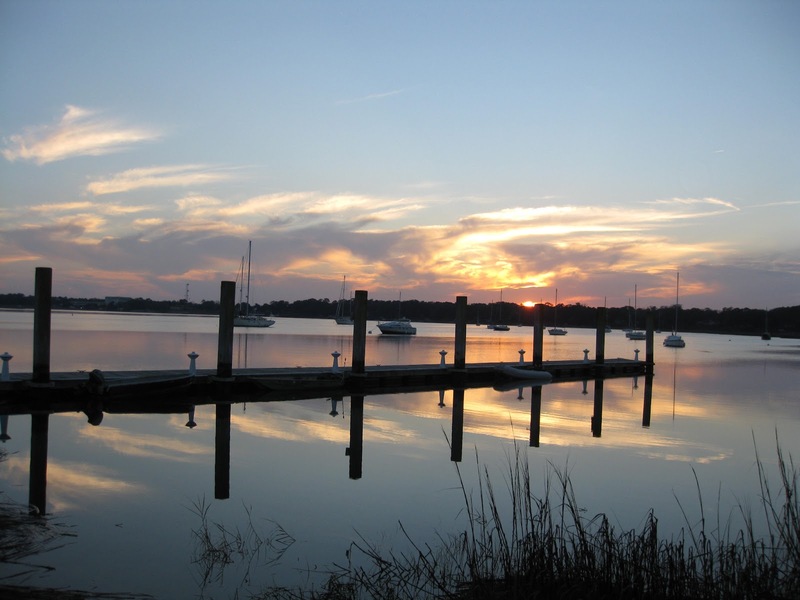 We decided to work with Marine Tech Services, which also is a Yanmar dealer. 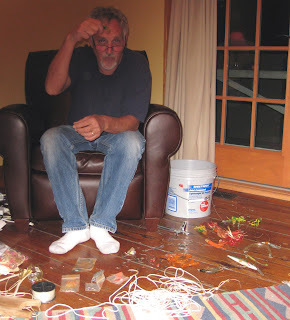 Gary Carr was very professional and knowledgeable, and got us up and running in less than three days. Gary removing our old transmission. While waiting for the transmission, we finally identified the problem with the dinghy motor as a broken fuel tip on the engine, and mounted a starboard running light to replace the one we flattened nicely leaving a slip in Southport, NC. And this is supposed to be fun? Despite the grounding and repair issues, believe it or not, we have had some fun along the way. Below are some photos of the better times over the past 355 miles. 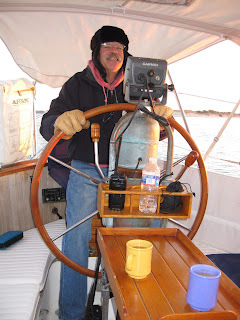 Fred at the helm trying to stay warm with some hot coffee. Philosophical discussions between Ernie and Bud along the ditch. 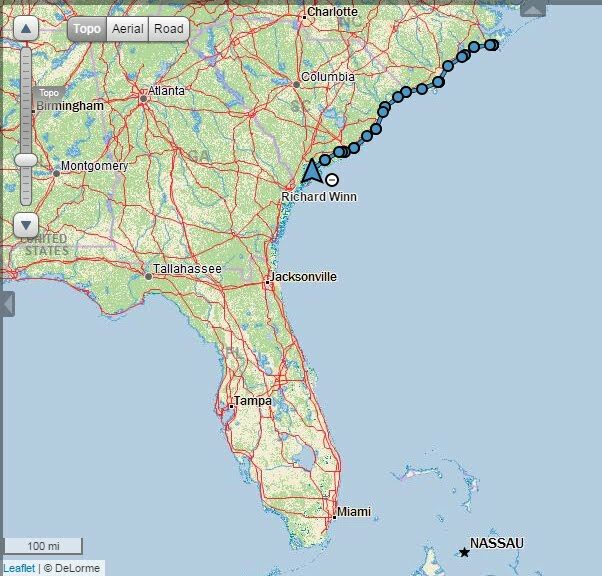 Only 934 miles to Key West from Southport, NC! 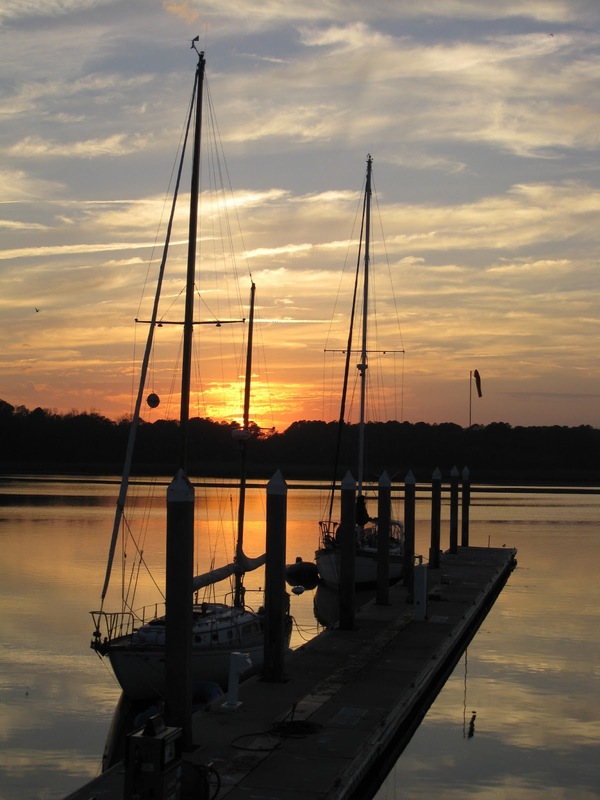 Docked at Cricket Creek Marina, SC. 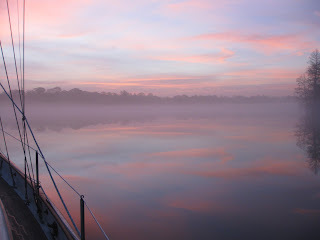 Sunrise on the Waccamaw River, SC. Shrimp boats rafted up in Georgetown Harbor, SC. Bud and Ernie shooting the breeze while waiting for the tide to turn after going aground. Ernie and Oliver aboard Acadia at sunrise in Awedendaw Creek, SC. Sunset at anchorage in Charleston, SC. 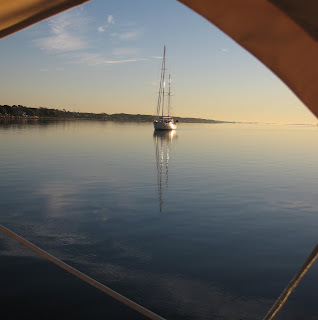 Rafted and at anchor with Acadia just north of Beaufort, SC. 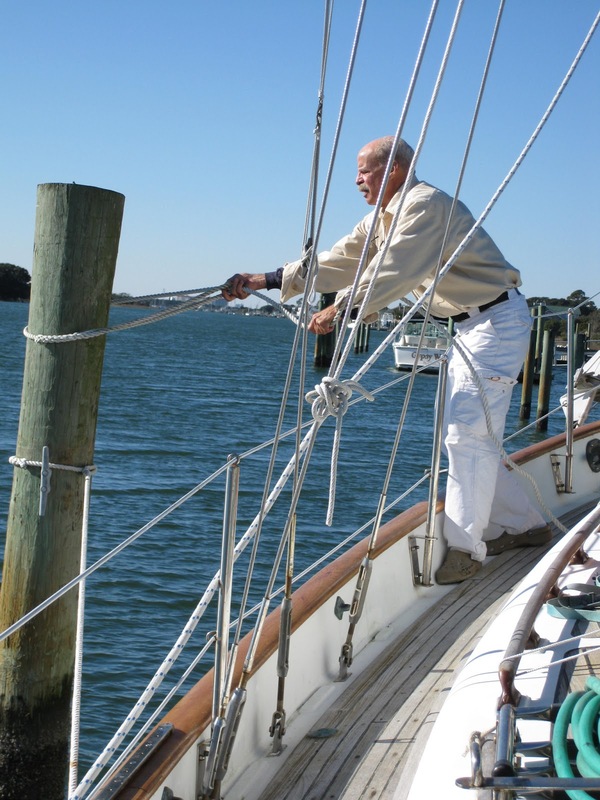 At anchor in Beaufort Harbor, SC. 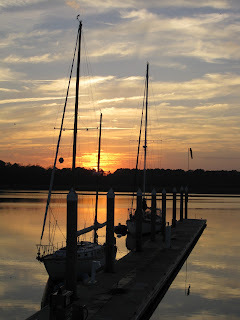 At dock at Skull Creek Marina, Hilton Head, SC. 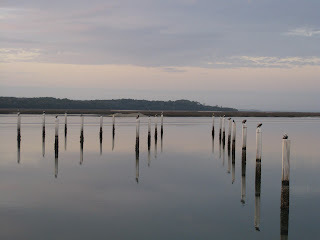 'Bird perches' (remnants of a dock from Hurricane Hugo), Hilton Head, SC. 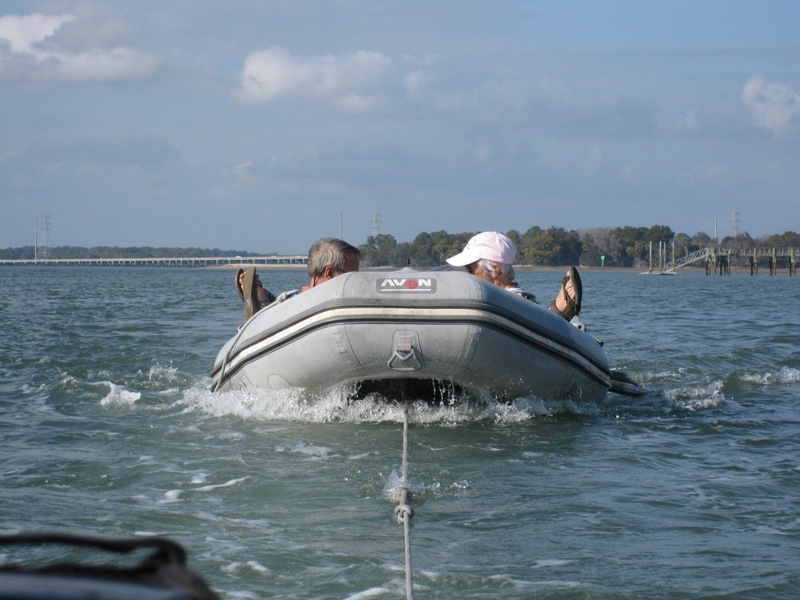 Zoe towing Ernie and Sarah in their dinghy, after switching fuel tanks and lines in Hilton Head, SC as part of troubleshooting the fuel issue on Zoe. I think they like reversing roles for a change! 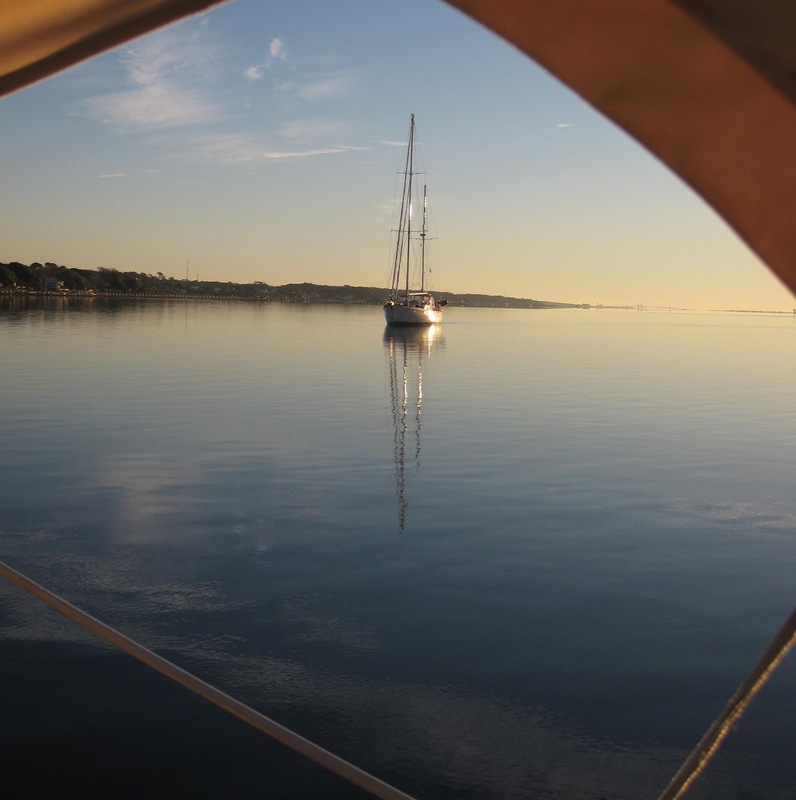 With Layla back in working condition, we are now anxiously awaiting a good weather window to finally get out of the Beaufort area! But no matter what happens next, we both are grateful that we have each other, and this adventure to experience together.